I'll be doing a bit of a rebuild on my table at some point. One of the improvements will be the linear rails on the table frame (X / long axis). Like the Torchmate rails I'll be using cold rolled flat rectangular bar. Does anyone have experience with this style and have any opinions as to their good and bad points. My main concern is about debris / molten spatter ending up on the flat surface then the bearings rolling over this. i run a 6x14 Torchmate X with downdraft table running production 8 hrs a day. 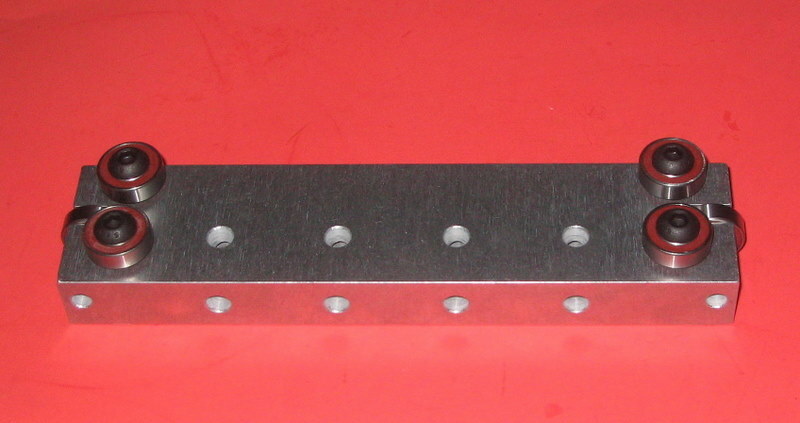 it has ground steel flat bar rails. It works fine. It it a compromise. you need to wipe the rails down, to get grit and dirt off. Don't use oil or wipe it off. I would have to disagree with this statement. If you are running a setup that has the center of gravity too far above the rail and try to run high speed required while cutting thin material you WILL need to capture the rail in some way. I am currently in the process of redesigning my gantry to incorporate the capturing of the rail as well as lowering the center of gravity. I have had nothing but trouble running thin material due to the gantry lifting off of the rails/twisting under fast direction change. I have a strong spring holding the gear rack that is mounted under the existing rail which still is not enough to keep in sitting firmly on the rails. Most of the manufactures of plasma tables capture the rail in some way or their higher end systems do. Thanks very much lads, great info. I'll definitely be capturing the rails, just like I've seen on quite a few Torchmate style bearing carriages. I'd like to have a system which is at least ready to stick a router on later. My gantry is way too tall and that's actually part of the reason I'm rebuilding, too much top heavy shake at the higher cutting speeds. I'm doing a combo of raising rail height while lowering gantry height. To give some corrosion protection while keeping the rails non stick, I'll be waxing them regularly. Then suppose a metal blade wiper (not actually touching) perhaps with a secondary brush wiper might be all that's needed to help keep them clean during operation. One thing I like about the Torchmate style rails is the easy adjustment of the gantry position for XY squareness, and even squareness of the gantry to the XY plane. Can't get that with many other rail systems. Plus much cheaper to buy and maintain. If you are running a setup that has the center of gravity too far above the rail and try to run high speed required while cutting thin material you WILL need to capture the rail in some way. I can definitely agree with you there. I should have clarified my statement to include a properly designed gantry. A Torchmate X table does not fully capture the rail. Or perhaps I should say the Torchmate X I have at work does not capture the rail. Bearings on cold rolled steel is the cheapest way to get motion. It is just a cut above a sliding block of wood. The benefit is that the bearings and rails are cheap and easy to replace. The downfall is they require the challange of constant tweaking to maintain accuracy, always need to be wiped down and they constantly require lubrication and are easy to ding and scratch. Once a ding or scratch is in a rail its there in the cut forever until you change out the cold rolled piece. You can try to spec out this type of bar from a mill but the accuracy leave much to be desired until you machine or grind it. That being said is it good enough for plasma? The quest is to make the most accurate machine to allow the constantly changing arc angle its best shot at following a tool path. You can get some decent cuts. To get very good and great cuts that rival laser the cost goes up significantly when you enter the realnm of a profile rail. Cold rolled steel is like the garage way of building a CNC platform. It can work but those in industry maintain a constant frusteration level with the issues. BTA Plasma wrote: Bearings on cold rolled steel is the cheapest way to get motion. It is just a cut above a sliding block of wood. The benefit is that the bearings and rails are cheap and easy to replace. The downfall is they require the challange of constant tweaking to maintain accuracy, always need to be wiped down and they constantly require lubrication and are easy to ding and scratch. Once a ding or scratch is in a rail its there in the cut forever until you change out the cold rolled piece. You can try to spec out this type of bar from a mill but the accuracy leave much to be desired until you machine or grind it. I agree with it being cheaper but maybe not the the cheapest. The cheapest is v groove bearing running on a piece of angle iron. not very accurate, cheaper that cold roll and bearings (because of the quantity of the bearings to capture the rail). I would prefer to go with linear rails (too tight of budget, maybe in the future as I start to make more money). I do have a rail on the gantry axis and love the motion. I have made concessions on accuracy to be able to make the size of items that I needed. For the issue of having nicks and grooves wearing into the rail, I have considered that. With the access to a machine shop that I have I will be able to grind the rails and smooth them back out as they wear. They should out live the bearings by at least three times maybe more. If I was building a plasma system to sell, yes I would go the way of linear rails. since it is just for me in my Garage. a garage type system work well for me and in many aspects is built better than some that are for sell in the internet. I have seen some systems out there that also use bearings on a simple tube that I would never purchase because of this wear issue. Some reason replacing the main components of a system instead of a wearable item seems counter productive and not a way to build a machine that is a major investment to many that purchase them. The aspect of accuracy on a plasma is over rated in my eyes. Yes you want to create good parts the best you can, but if the part needs to anymore accurate then a tolerance of .005 it needs to be made in a different manner on a different machine that is made to hold these accuracies. Oops did i step on a soap box, sorry for that. I just get annoyed by machine builders putting down someone that is capable of building a better system than they can buy, just can't afford to do. Working with over 85 cnc plasma machine builders for over 35 years in my various positions with Hypertherm.....I have seen a lot of different motion ways. Keep in mind first that cnc plasma cutting machine vary dramatically in size, in price, in performance. You can buy a 2' x2' cnc plasma machine for under $3000....and you can buy a 40' x 350' cnc plasma with two rotaing bevel plasma's for about 1.5 million dollars. The plasma cutters themselves go from (Hypertherm) a 30 amp air plasma that sells for around $1200 that is the size of a two slice toaster.....to the 800 amp, high definition class HPR800 with two parralleled 400 amp power supplies for about $105,000. Todays top of the line air plasma systems get better consumable life and provide more accurate cuts than the industrial plasma's of 20 years ago, yet are no match in terms of cut quality, edge metalurgy, cut speeds and consumable life when compared to the industrial systems available today. If you put a $2700 Powermax 65 on a $3000 dollar entry level cnc machine will it cut as well as the same plasma on a $100,000 precision industrial machine? The cuts in reality would probably be very similar when both machines were new, however I would expect the industrial machine to still be cutting parts on a high productivity level long after the $3000 machine had worn out its drive motors, its bearing surfaces and its mechanicall components. Of course all of those things can be replaced, however just the act of doing machine maintenance takes away from the levels of productivity that are demanded from industrial quality production machines. These industrial machines are designed to work 3 shifts a day, 365 days a year under high duty cycle conditions and often with multiple torch heads operating simultaneously. So, the bearing or "way" designs continue to vary depending on the intended use of the machine, the sheer size and weight of the machine, as well as the cost of the machine. Most industrial precision machines use recirculating bearing type ways today. Large shipyard and steel service center machines typically use floor mounted rails that resemble rail tracks, although these rails are often precision ground and hardened for long life under tough conditions. Many of the lower cost machines (under $20,000) use either low cost recirculating bearings, ground flat bar, V rails, or in some cases use cam follower bearings that ride directly on the steel tube frame of the machine. In most of these cases an air plasma is the cutter of choice, and as long as the guiding ways are straight, and the machine is designed with adequate speeds and accelerations to allow for the plasma cutters best cut quality...then that is adequate for the majority of applications. Of most importance to cut edge quality, dross formation and warpage is the ability to rapidly accelerate out of corners and intricate details to the design cutting speed requirement of the plasma cutter being used for the material being cut. Typically, to cut the full range of material that an air plasma can cut....from the thinnest gauge to the thickest plate....the machine needs to handle a speed range from about 5 inches per minute to as much as 400 inches per minute. I'm in agreement with Jim about the flat CRS rails being quite fine for air plasma as far as accuracy is concerned. To me the "floppy" nature of a low end air plasma jet is more the limiting factor than a ground linear rail accurate to 1/100th mm. The jet / flame tends to trail at about 15 degrees and that transfers to corners unless the corner can be looped. I've seen the surface finish I get on my milling machine and there's certainly no lumps and bumps that would cause the rail surface finish to be reproduced in the plasma cut edge. The accuracy of the cut on a milling machine would be perfectly acceptable providing the milling machine is accurate itself. I've spoke with an ESAB installation technician at a manufacturing show. They set their rails straight with piano wire stretched out taught (absolutely no kinks in the wire of course). That's how I did my cheapi angle iron rails except I used nylon fishing line, but I never though high end industrial ESAB tables would get set up that way. The accuracy is as good as I got them lined up. I find even the basic surface finish on the angle iron is OK for air plasma, although I did sand off all the mill scale before putting them in use. There's never been any cut edge issue which has been attributed to the surface finish of my cheapi angle iron rails, any and all issues have been more to do with the floppy plasma jet, or table controller settings, etc. CRS flat bar is going to be an improvement on angle iron. I personally find all this stuff about ground rails to be a bit of a joke when it comes to air plasma. To me the biggest factor in accuracy is the setup of the rails. Getting them mounted perfectly straight, perfectly horizontal, parallel to each other, parallel with the top of the slats, the X & Y axis perfectly at right angles to each other, the Z axis perfectly perpendicular to the XY plane, and more. I bet most low end tables are not setup perfectly in that regard and it's something which seems to get little mention in table building threads. Large machines with floor rails up to 350 feet long were often set up with transits along with piano wire. Squareness of these large machines was usually adjusted by using the actual plasma or oxy torch to marke corners of a large rectangle....then diagonal measurements were made with a tape measure! Accurate enough when talking large distances used for shipyard machines. Today lasers are used to set the large machines up in the field. The industrial grade precision machines (in the $100k range, equipped with high definition plasma, not air plasma) generally are under 8 feet in width and are built with good quality recirculating bearing ways. Most of these machine designs incorporate heavy welded frames which are stress relieved then the mounting surfaces for the ways are milled for accuracy.....in other words are built like a machine tool. They are heavy, yet very accurate.....both of which contribute to vibration free, repeatable cut quality. Drives are always rack and pinion, however the better quality machines use helical racks, zero backlash planetary gearboxes, AC brushless servo drives that are inertia matched to the weight of the machine, etc. I always hear people say that their $10,000 cnc plasma cuts just as well as a $100k plasma or a $400k laser. If you cut the same part on the low cost machine in quantity....and do the same with the industrial design machines.....then measure each part using a coordinate measuring machine and compare using statistical process control.....then you will see why industry chooses to spend more money for their machines! In my career at Hypertherm I have been involved in these comparisons countless times. In my home shop, with the relatively small quanity of parts I produce....my air plasma and entry level machines are perfect, as they are for thousands of users worldwide. I love hearing about how life on the other side is like. I used to be an industrial electrician and I do sometimes miss the top end machinery you see there. I squared my gantry using the diagonal pythagoras method but I just fixed a fine tip pen to the z-axis. What you told me about the preparation and setup of the rails on the high end systems certainly shows that a rail is only as accurate as it is mounted. My gantry rail is a Hiwin recirculating bearing type, 1.8 metre long. When I bought the rail I eyed it up while holding it nearly horizontal with one end supported in the air, I could see the sag caused by nothing more than its own weight. Because it was mounted on the side of the gantry I had to painstakingly shim it at each bolt hole to get it dead straight. If I had just bolted it on to the square tube (the way many seem to be mounted) it would not have been dead straight. All that precision ground surface is worth zippo without precision mounting to make use of it. I get the impression a lot of tables may be as accurate at the steel frame / tube to which the "precision" rails are mounted. Many parts may not need this accuracy but I think it's something that a lot of builders / buyers don't consider when choosing precision linear rails. Maybe there's an automatic assumption that because the machine has "precision" rails then they are automatically perfectly straight, etc. I sell used machine tools, and talk to a lot of guys about machine tool design, here is my take. The table being level is important to a point and the is the slats even new will not be level and after being cut into so they never will be level. Now the rails should run as parallel as possible and square. Small height changes in the rails will do very very little to the cut quality. Remember, the farther the guide or mechanical control device is from the machining or cutter point the less impact of small imperfection has on cut quality. Take a 10 foot straight edge and place a dime under one end and take another dime and try to slide it under the straight edge at the 5 foot mark and the error is less and the dime will not slide under and the error is almost gone at the end of the straight edge. Since CNC plasma is a 2D machine, side movement is the most important factor, so just make sure the rails are adjusted as parallel and square as possible and all roller bearings are smooth. Next is the gears and tracks need to be adjusted to match the rails and and adjusted with the smallest amount of backlash. If the side rollers hit a small nick in the rail on one side there will be very little affect on the cut quality as the side thrust it canceled out by the opposite rail guide. Any nicks or damage to the rails will really affect the life of the rollers and rails. I think that cut quality can be improved more by the software that controls the cutter and motors. This is a 5 year old thread and things have changed. When I started my machine I bought some 15mm Hiwin linear rails for the X axis on the gantry. Later I purchased some 25mm linear rails for each side of the table cheaper than the 15mm rails from AliExpress. There is really no excuse not to use linear rails today (assuming you can build a table that is square to mount them to).